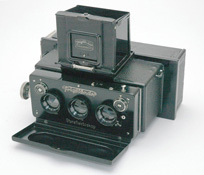 Stereoscopic cameras taking two pictures to make 3D photos were successful in the beginning of XXth century. then manufacturing special stereoscopic cameras for 3D pictures. 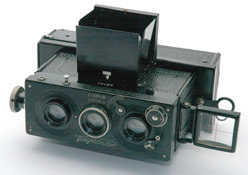 Two models are well known : the Stereofotoskop with a simple reflex finder and the Stereoflektoskop with a real reflex finder. The Stereofotoskop uses only 4.5x10.7 plates, but the Stereophotoskop uses 4.5x10.7 or 6x13 plates according to the model.